MIOT International’s team of twenty physiotherapists deal with the remediation of impairments and disabilities, and the promotion of mobility, functional ability, quality of life and movement-potential through examination, evaluation, diagnosis and physical intervention. Physiotherapy is called the ‘orthodox alternative therapy’. Our trained and expert physiotherapists use a number of complementary forms of medicine and therapeutic treatment methods such as massage, reflex therapy, and therapeutic exercise in order to relieve pain and restore mobility in our patients. At MIOT International, our physiotherapists first analyse the problems carefully, taking into account how each specific one impacts the patient’s lifestyle. 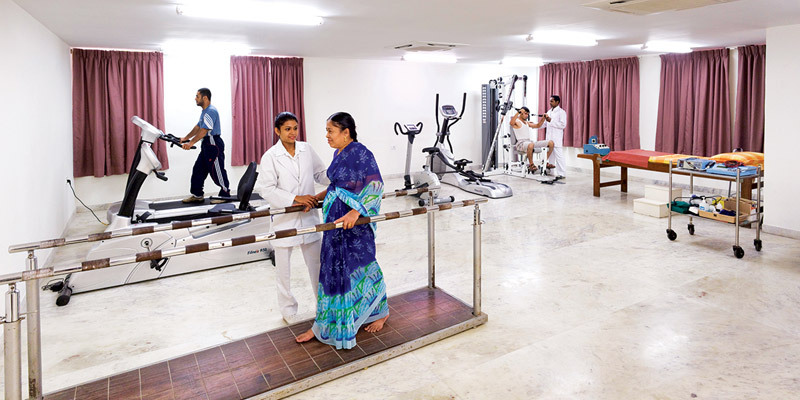 A customised physiotherapy routine is then devised for the patient. The physiotherapists also spend time with patients, advising them on how to deal with and also prevent recurrences of the conditions that they are being treated for. The Back School is a special programme that deals specifically with chronic back pain. Acute back pain may be caused by problems in the abdominal area, spinal cord, blood vessels, bones and discs. It could also be related to psychosomatic issues, poor posture and stress. The doctors and physiotherapists at the Back School work with patients to identify the root cause of the pain. The team then facilitates group discussions and exercises to return the patients to normalcy.